Hadn’t really planned on adding another thoran posting because the basics of a thoran recipe are same, but then again today’s lunch has Beans thoran and that provides me with a photo opportunity. Cooking anything green reminds me of my husband. To Mobin, vegetable has to be green: achinga, french beans, palak or the normal green spinach, ladies finger, snake gourd.....you get the picture. There has to be one green side dish to the cooked rice. Getting a variety of colours on your plate ensures maximum variety of vitamins and minerals in your diet. So today I’ll be having green beans thoran, yellow Meen peera with some bright red pickle and brown sambar over steaming white hot rice. Yummy! Chop the beans as finely as possible. 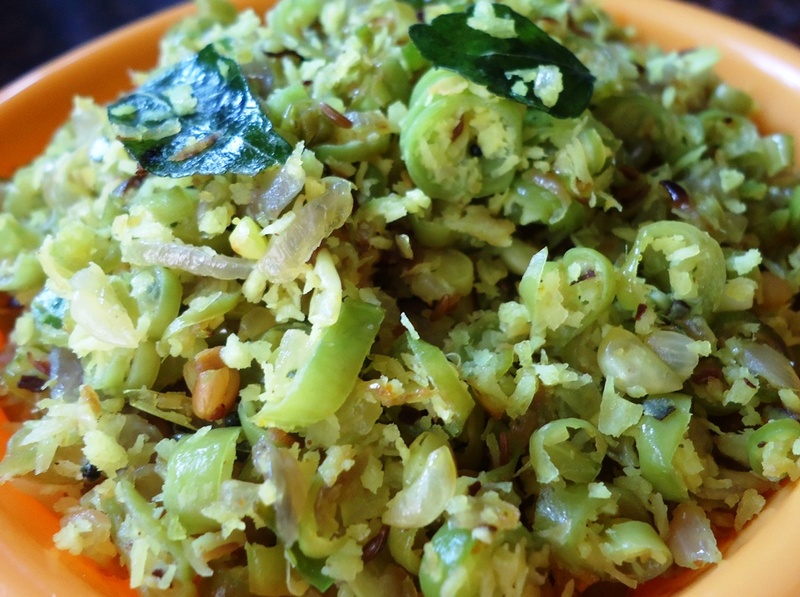 Grind together coarsely the button onions, coconut, green chillies, one sprig of curry leaves and cumin seeds.. Do not blend too much; it has to have a crushed texture. Heat oil. 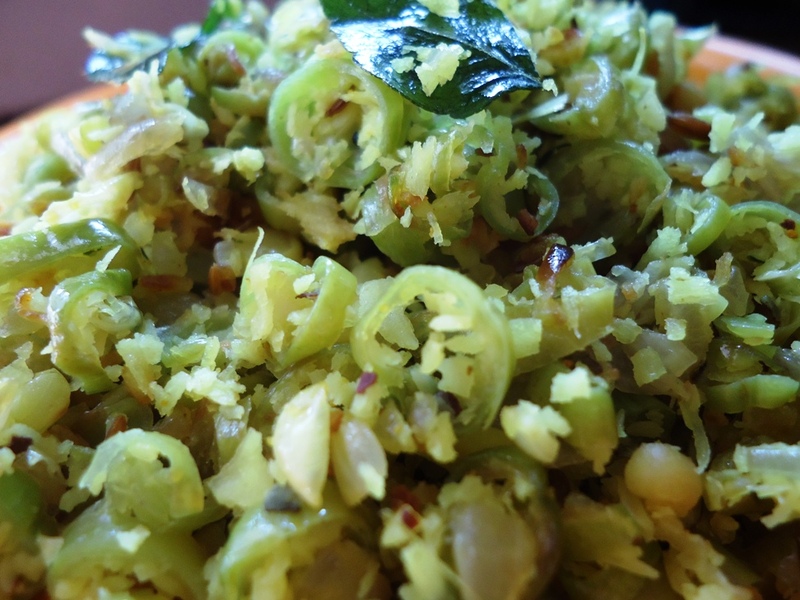 Add mustard seeds, when they splutter add remaining curry leaves. Add the chopped beans, ground masala and salt. Toss well. Sprinkle a little water. Cover and cook on low fire, stirring occasionally to prevent from sticking and burning. About 10 minutes. Adding shredded carrot makes a nice contrast and helps to make the dish more appealing. Not covering the beans during the cooking process helps to retain a brighter green colour, but it takes longer to cook the food. Colours are important in our perception and satisfaction of the meals. It makes the food more appetizing.